Every Thursday, put on your thinking cap for trivia. Challenge your mind while drinking your favorite Right Proper beer. Free to play, prizes to win! Come on in to our Brookland Production House every 2nd Saturday of the month for a Cheers & Namaste class! Yoga instructor Ramona Leigh will guide you through a 1 hour, all level yoga class, while drinking a 3 beer flight! Get your tickets here. Chef Vernon Price of Eat170 never leaves us disappointed. We crave his Dooney Rolls - smoked turkey and collared greens egg rolls; we were delighted by his bratwurst tacos, and oh, that mac and cheese! Whatever he's cooking up, it is sure to go great with a fresh, crisp Right Proper beer. Come in to our Brookland Production House on Saturday, January 5th for regionally inspired, all natural dumplings. Nomad Dumplings will be serving up some of their favorite flavors, sure to pair perfectly with a Right Proper beer! Soft, fluffy and delicious are words that come to mind when we think of Bun'd Up's hand made buns. Filled with all natural meats and local produce, they're sure to satisfy! They’ll be at our Production House every Saturday in December, so come grab yours while they last! Our favorite sandwich finally has it’s day! Every Monday, at our Shaw Brewpub, a Chick-Filet and a Right Proper draft beer are just $15! That’s right! From 5-11pm every Monday get our classic Chick-Filet, or try a twisted version (think chicken parm or buffalo style), plus a house draft beer for $15. Grab yours before they’re gone! Right Proper Shaw Brewpub is turning 5 this year! We're celebrating by throwing an anniversary bash featuring an all-star lineup of 5 vintage beers, 5 throwback beers and 5 throwback bites. The party will feature live music by a trio from local bluegrass / Americana band, By & By. Our friends from Humane Rescue Alliance will be out front with their adoption vehicle. Tickets are $40 each, and includes 5 four ounce beer tastings, unlimited food, tax, gratuity, and you'll also take home a special anniversary bottle of our Solera Style Flemish Red, Le Flâneur! Space is limited, so get your tickets here now! Come check out Rock Creek Food Company at our Brookland Production House on Saturday, 11/17. They're known for their housemade sausages and savory sides. Think pork sausage on a baguette with grandma Tzutzi's 10 hour sauce, smoked eggplant yogurt sauce and pickled slaw or chicken sausage on a bed of quinoa, buckwheat, seasonal veggies, toasted almonds and red wine vinaigrette. Come by our Brookland Production House for our 2nd Annual DC Beer Week Record Fair! Browse through records from Songbyrd Music House & Record Cafe, Rasslin' Records, Joint Custody and more with your favorite Right Proper beer in hand. We'll also have delicious eats from Nomad Dumplings and Bri's Brookland Creamery. The fun runs from 12pm-5pm, so stop by anytime! No ticket necessary. On Wednesday, August 22nd, Right Proper Brookland Production House will host an elite group of local homebrewers as they do their best to recreate this year's Solidarity Brew. Taste your way through the participants' pilsners for free, and vote for your favorite. At 8:30pm, our panel of expert judges will announce their winner along with your fan favorite. There will also be a food vendor onsite to fill your belly with tasty treats. Come for the beer, stay for the solidarity! Pizza and beer. What an awesome combination! Come to our Brookland Production House this Saturday, January 13th and have both! Cipolla Rossa will be here with their wood fired pizza oven on wheels and serving up delicious brick oven Neapolitan style pizza, made by hand using the freshest seasonal ingredients available. Our mouths are watering already! Wish you soaking up some sun in the Caribbean? Don't we all! At least we can get those delicious flavors up here in DC. Reggae Flava will be at our Brookland Production House on Saturday, May 19th, serving up curries, jerk chicken & pork, oxtail and many more of your Caribbean favorites. Love hibachi and teriyaki? Well you're in luck! New food truck, Cluck Truck, will be curbside on Saturday, 5/12 serving up authentic hibachi meals cooked fresh to order. Grab yourself a teriyaki bow, hibachi bowl or fried rice to go along with one of our brews! 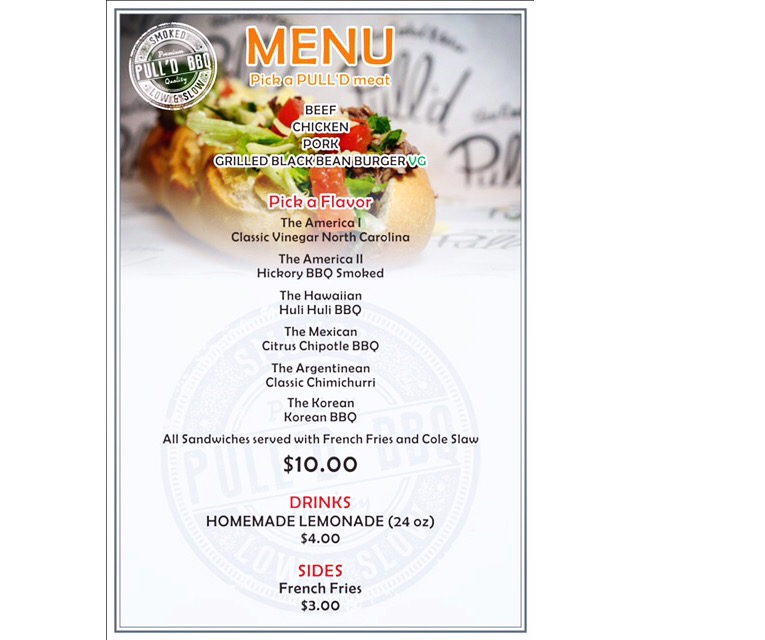 We're welcoming newcomer Deco Deli food truck to our Brookland Production House on Saturday, 4/28. They'll be serving up delicious, decadent sandwiches curbside. Make sure to grab a nice cold beer to wash it all down! Don't you think a hot dog is the perfect compliment to one of our beers? We do! And on Saturday, 4/21, Dogs on the Curb will be outside our Brookland Production House from 1-6pm. Try one of their specialty dogs or build your own! After years cooking in Northern Italy, local Italian-American chef, Gerard Solazzo, brings authentic pizza to the DC area. He prides himself in quality ingredients for creative recipes. His mobile wood-fired pizza oven will be at our Brookland Production House on Saturday, 4/14, serving up delicious pizzas to eat alongside one of our cold beers. Take a trip to the Middle East with Roro's Lebanese food truck. They'll be hanging out all day at our Brookland Production House and serving up handmade Lebanese food with a modern twist. Think pita tacos, shawarma, falafel and hummus made from an old family recipe. Wash it all down with a Right Proper beer! Come to our Shaw Brewpub this Wednesday and get your first taste of our Heavy Seas collaboration brew, Cafe au Lait. This Vanilla Malted Oat Stout - brewed with velvety malted oats, milk sugar (lactose), locally roasted coffee, and a touch of vanilla bean - is a sumptuous, earthy, mysterious, and decadent brew that promises to intrigue. In a world of thick, chewy, cloying and overly boozy stouts, we present to you, a true anti-imperial stout. The guys from both breweries will be there to chat, cheers or answer any of your burning questions. Do you spend your Sunday nights wishing the weekend could last a little longer? Join Brookland Yoga founder Sharlene for some mindfulness, restoration, stretching and craft beer at our Brookland Production House for a 60 minute yoga class with followed by your choice of pint in the tasting room. We may not be able to stretch out your weekend but at least we can make it a little more awesome. Ring in the Chinese New Year with Nomad Dumplings at our Brookland Production House! Grab yourself some tasty dumplings along with a Raised By Wolves to celebrate 2018, the year of the dog. Nomad Dumplings will be serving up old favorites alongside some specialties for the New Year from 1-6pm. We are so excited to have Jose Andres' Pepe food truck back at our Brookland Production House! Have a taste of Spain with flauta sandwiches that include the butifarra “burger” (fresh pork, roasted peppers and alioli), pollo frito (fried chicken), escalivada (Spanish-style roasted vegetables), jamon Serrano y queso Manchego (the classic Spanish ham and cheese) and many more! Cure what ails you with Prescription Chicken on Saturday, August 26th. From 1-6pm, they'll be serving up their delicious soups to fit perfectly with any mood. Feeling stressed? Try a fortifying bone broth soup. Happy? Taste their Grandma Style chicken soup that'll take you back to the good ol' days. They also have a Chickenless soup for all of you veggie lovers out there! However you're feeling, Prescription Chicken has a soup to match! On January 20th, we're welcoming back the Social Sweat to our Brookland Production House for a barre and brews class! Start the day with a 50 minute barre fusion workout followed by a beer in our tasting room. Bring your yoga mat and water, and be ready to sweat! Get your tickets here before they're gone! Stop in to our Brookland Production House this Saturday and meet our new friends fro Trusst Catering. They'll be serving up tacos, arepas and Cuban sandwiches which will go perfectly with a nice cold beer! Chris and James of Cured are back after a short hiatus with more delectable charcuterie! On December 16th, they're bringing duck a few ways plus some great tasting veggie options. Stop in our Brookland Production House for some tasty meats and a beer! Join us at Right Proper Brookland Production House, as we welcome our friends from Old Westminster Winery and Checkerspot Brewing, for a fall wine and beer celebration. Old Westminster Winery will be sampling tastes of newly released Seeds & Skins (also available by the glass or can), an orange Pinot Grigio with delicate honeydew melon aromas, refreshing acidity and soft texture; driven by fresh floral and white peach flavors. We’ll also have August October flowing from the taps, featuring fresh Pinot Gris juice and pommace straight from the winery in Maryland. Meet the minds behind the creation of these two skin-contact beverages, including our friends from Checkerspot Brewing, opening in Baltimore in March of 2018. We will also have Eat 170 onsite with some delicious comfort food, as well as the Capitol Hillbillies playing some sweet bluegrass jams all night long. Admission is free, so stop on in for a night of grapey fun that won’t leave your mouth purple. Join us on Sunday, November 19th for our 2nd installation of music and art at our Bookland Production House! We'll have talents from An Invisible Art Collective, La Mezzo Voice Studio, and our own Right Proper staff showing off their stuff. We'll be raising money to benefit the Dominican Alliance and The Puerto Rico Physicians and Surgeons Association. Right Proper will also donate $1 of every beer sold during the event to hurricane relief. So come on out from 6-8pm and enjoy great music for a great cause!